Drawing on political theory and descriptive case studies, Matt Qvortrup aims to create typologies of referendums that are held to endorse secession, redraw disputed borders, legitimise a policy of homogenisation, or otherwise manage ethnic or national differences. He considers the circumstances that compel politicians to resort to direct democracy, such as regime change, and the conditions that might exacerbate a violent response. Gary Wilson believes the book will be of interest to political scientists and international relations scholars as some chapters are heavy with mathematical formulae used to predict the probability of various outcomes of referendums. Referendums and Ethnic Conflict. Matt Qvortrup. University of Pennsylvania Press. February 2014. The subject of this book – the use of referendums as a mechanism for addressing ethnic conflict – is of considerable topical relevance. Applying a broad understanding of the notion of ‘conflict’, as the book does to encompass political differences and disagreements grounded in ethnic distinctions, numerous recent and current examples abound. One might cite the independence referendums held in Quebec (1995), East Timor (1999) and South Sudan (2011), or the forthcoming referendum on Scottish independence, among others. Referendums are undoubtedly a common feature of processes concerned with devolution, power-sharing, and secession. The overriding objective of the book, set out in the first couple of pages, is to determine when different kinds and types of referendums on ethno-national issues occur and whether these lead to the exacerbation of conflict or rather have an opposite effect. In addressing these questions, the book draws upon examples from the time of Napoleon’s reign as French emperor to the present day. The first chapter traces the use of referendums up to World War Two. It is argued that their first main use was by Napoleon, with other examples cited including those held on secession in some US states at the time of the American Civil War, autonomy referenda in Canada, South Africa and Australia, and Norway’s 1905 vote on independence. Post-World War One, it is contended that the use of referendums declined. In the subsequent chapters, attention is focused upon different uses of referendums to resolve to ethnic conflict. Chapters two and three are concerned with ‘difference management’ and secession referendums. The former concern those referendums used to approve policy initiatives associated with accommodating differences within a society, typically the devolution of power or power-sharing arrangements. The eminent constitutional scholar AV Dicey evidently considered the referendum to constitute an “alternative second chamber” through which the will of the people could be expressed, although the author notes that ‘difference management’ referendums were rare until the 1970s and are far more likely to be used in ethnically diverse societies with high levels of political freedom. Referendums on secession are found to occur following momentous changes in the international system. It is argued that they can aid peaceful transitions, reducing the risk of warfare where they precede secession. Chapter four considers the legality of referenda in terms of constitutional law, noting that the courts have blocked their use in Spain and the US. A case study of Scotland is employed here in order to highlight some of the key constitutional legal issues which the holding of referenda can give rise to. This chapter sits at odds with the book as a whole, however, given the lack of treatment of any of the international legal issues which processes such as secession give rise to. There then follow treatments of ‘right-sizing’ and ‘difference-eliminating’ referendums. The former are largely concerned with the settlement of borders. Case studies touched upon include Schleswig and India/Pakistan, although this kind of referendum has become rare. The latter kind of referendum is said to be held to show that a leader or regime has the unified support of a state’s population, arguably demonstrating some of the more sinister motives which can exist to underpin the decision to hold a referendum. Hitler himself most infamously used such initiatives to demonstrate support for the Third Reich, although they have been used more recently by dictators such as Saddam Hussein, just one of several examples which are overlooked in the book. Referendums have been often used as a mechanism for public consultation on processes concerned with European Union integration going back over several decades. Chapter seven is concerned with this use of the referendum mechanism. Although their use varies from state to state, at various intervals referendums have been held to obtain the consent of a state’s population to join the EU, adopt the Euro currency unit, or approve further treaty agreements between the member states. Unfortunately, there is no treatment of any of these specific examples, the brief discussion noting that referendums on EU integration have been primarily held for tactical reasons. The final chapter attempts to provide a comparative treatment of the various issues associated with the actual administration or referendums. In some respects this is the most interesting feature of the book, the recent experience of the forthcoming referendum on Scottish independence alone having highlighted some of the difficult questions to be addressed when determining arrangements for the referendum. These include: Who ought to be entitled to participate? Which voting system should be used? Is there a quorum to be reached for a referendum’s outcome to be respected? 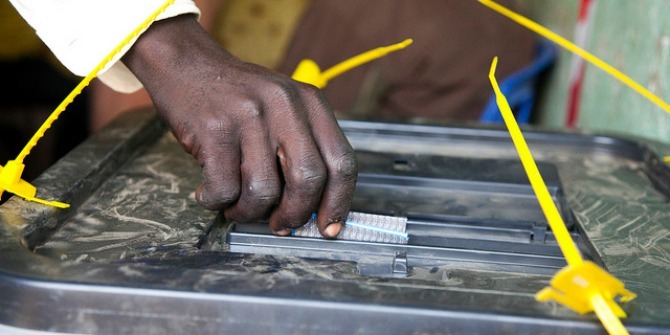 How can security for those administering and participating in the referendum be assured? How is spending by either side of an argument to be regulated? Overall, the book emphasises the potential value of referendums in resolving ethnic conflict, albeit noting the importance of parties’ willingness to conciliate. The project taken on by the book is a worthwhile one, but it is not without its shortcomings. More effort might have been made to develop comparisons between examples of the various kinds of referendums and the factors determining their effects. The book is also heavy on mathematical formulae to predict the probability of various outcomes of referendums, which narrows the likely receptive audience for the book to academics grounded in such approaches. The book will be of interest to political scientists and international relations scholars, although a wider general audience would exist had it been more a more accessible read. Note: This article is provided by our sister site, LSE Review of Books, and gives the views of the author, and not the position of EUROPP – European Politics and Policy, nor of the London School of Economics. Gary Wilson is Senior Lecturer in Law at Liverpool John Moores University. He specialises in collective security, use of force, and issues of secession and self-determination.